It has been a nightmare to get sailmail connections since we arrived in the Tuomotus, hardly surprising as the nearest stations are in Honolulu and Sydney (3000 miles each) - we did hitchhike across the atoll of Rangiroa to another village in search of the internet but had no luck - so we are still waiting to catch up on our hotmail since the Galapagos. We went to take our dive but when we got their our divemaster advised they were doing a special dive that afternoon with a filmmaker - we decided to be brave and went for it. We went out of the pass in the dive boat where they dropped us in the deep blue water 2000m deep, we went down 20m, then they lowered a cage of fish bits and then the sharks came! Yes sharks and not small friendly looking ones like we had seen in the Galapagos, these were huge, really mean looking sharks with bits missing all over them. Their beady eyes staring right at us, as sped backwards and forewards to enjoy their feeding frenzy within a few feet of us. There was about 20 grey reef sharks and several larger silver tipped sharks, then a lovely huge bottle nosed dolpin came to play too. The experience was amazing, I'm not sure if I actually enjoyed it at the time but it really was incredible. We had our first meal out in ages at the Kia Ora hotel just near to where we were anchored, I dug out my kitten heels and Andrew smoothed out a shirt and off we went to be civilised for an evening - it was great and we were really looked after by the hotel staff when they found out we had arrived by yacht - two cocktails cost more than we had spent in the last month though! We took a trip to village of Tiputa across the pass. We zoomed over in the dinghy trailing a local boat so we knew where to go to miss most of the current, he also smoothed the way for us with his wake. We came across a house with beautifully sewn traditional polynesian patterned material covers and displays of stitching, we were invited in by a lady and she introduced us to her Uncle who made these things to sell in Papeete. He showed us his workshop which doubled up as the front room and samples of his work; he agreed to make us a bedspread. When we collected it a few days later and gave him a postcard from England he was so thrilled that we loved it so much he gave us some pillow cases and we were all very happy indeed. We had truly amazing weather while in Rangi so much so that we took the opportunity to explore the lagoon a little. 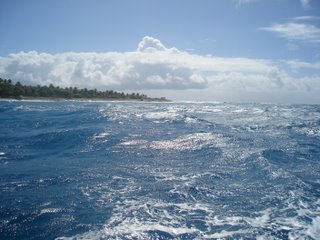 We left the main anchorage and charted zone and headed off in search of our own little spots in paradise. The water was so clear we could see the bottom in 20m which made spotting coral heads easy, we stopped in four different spots in the lagoon and all were just perfect and we were on our own with just fish for company. Unfortunately though we left our motor on the dinghy one night in our relaxed state and the valve failed sending the engine for a little swim - so we headed to Tiputa again in search of fresh fuel and spark plugs but found a village bbq on the sea front. We joined a group of locals drinking and relaxing on the gorgeous Sunday afternoon and had a fab meal of duck and some kind of meat, we met Tauta as we had anchored in front of his house, next thing we had half the village around us trying to communicate with us in our very poor French. While we sat in the sun three dolphins gently swam by making little arches right in front of the gathering - wow! Tauta took Andrew off on his scooter to show him where his house was so we could visit him the next morning, it turned out he was a mechanic so gave us some spark plugs (unfortunately they didn't fit, but how kind??). We went to visit Tauta and his family the next morning and he showed us around his home and talked with us about the atoll - such a lovely man we felt really honoured to have met him and be invited to his home. The houses have several buildings some communal and others just beds, generations of one family live in the same place. 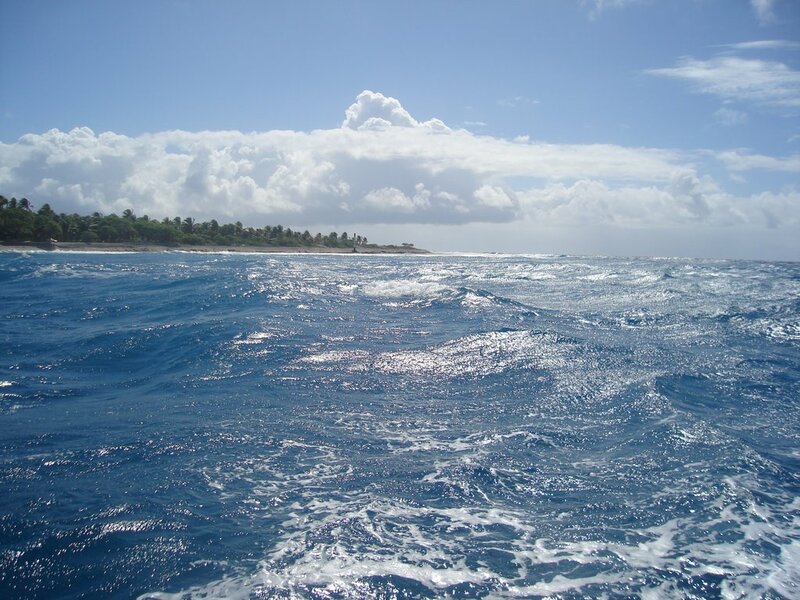 The next day we sailed across the lagoon to the village of Avatoru, there was only about 3 knots of wind so it was very slow but just a beautiful day and with no time pressure it was great to enjoy sailing for a change rather than only sailing to get somewhere. That evening we left through the Avatoru pass and waved goodbye to our beautiful Rangi and the wonderful people we met there. This is the sad thing about this life - it is always time to move on. 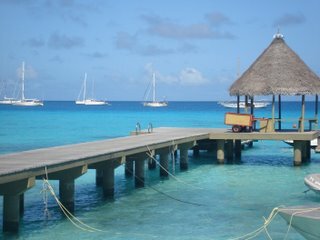 Next stop for us, Moorea, just north of Tahiti in the Society Islands. The passage to Moorea started off very slow as there was very little wind but the second day the trade winds filled in a we had a great sail, at first light this morning we saw our first glimpse of Tahiti and Moorea - this was very exciting indeed I think perhaps because Tahiti is what you think of for the South Pacific and it feels along way from home. 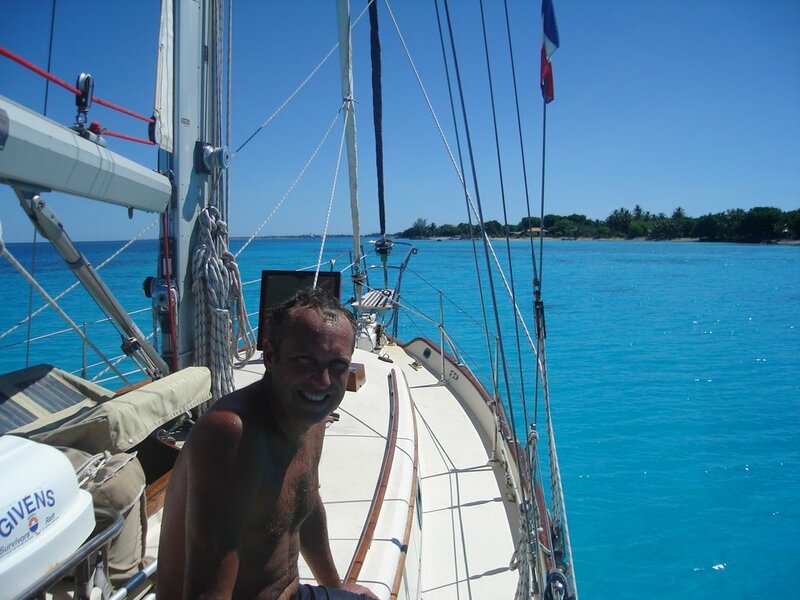 We sailed passed Marlon Brando's island and made our approach to Moorea. The islands are green and mountainous like the Marquesas but fringed with coral reefs so we had to find the pass into Cook's Bay. Thankfully the pass was nothing like that at Rangi more like entering a harbour but careful attention to the buoys is still required, just after we entered a huge squall passed over but luckily we were safely in the bay now. The squall has stayed with us today so our first experience of the Society Islands is rain lashing down and howling winds - just perfect for catching up on our blog with a cool G&T! We have been a bit busy since we arrived in Rangi (local name as we feel like locals) plus it has been a bit difficult to get sailmail connections - we did hitchhike across the atoll to another village in search of the internet but had no luck - so we are still waiting to catch up on our hotmail since the Galapagos. We went to take our dive but when we got their our divemaster advised they were doing a special dive that afternoon with a filmmaker - we decided to be brave and went for it. We went out of the pass in the dive boat where they dropped us in the deep blue water 2000m deep, we went down 20m, then they lowered a cage of fish bits and then the sharks came! Yes sharks and not small friendly looking ones like we had seen in the Galapagos, these were huge, really mean looking sharks with bits missing all over them. Their beady eyes staring right at us, as sped backwards and forewards to enjoy their feeding frenzy within a few feet of us. There was about 20 grey reef sharks and several larger silver tipped sharks, then a lovely huge bottle nosed dolpin came to play too. The experience was amazing, I'm not sure if I actually enjoyed it at the time but it really was incredible. We had our first meal out in ages at the Kia Ora hotel just near to where we were anchored, I dug out my kitten heels and Andrew smoothed out a shirt and off we went to be civilised for an evening - it was great and we were really looked after by the hotel staff when they found out we had arrived by yacht - two cocktails cost more than we had spent in the last month though! We took a trip to village of Tiputa across the pass. We zoomed over in the dinghy trailing a local boat so we knew where to go to miss most of the current, he also smoothed the way for us with his wake. We came across a house with beautifully sewn traditional polynesian patterned material covers and displays of stitching, we were invited in by a lady and she introduced us to her Uncle who made these things to sell in Papeete. He showed us his workshop which doubled up as the front room and samples of his work; he agreed to make us a bedspread. When we collected it a few days later and gave him a postcard from England he was so thrilled that we loved it so much he gave us some pillow cases and we were all very happy indeed. We had truly amazing weather while in Rangi so much so that we took the opportunity to explore the lagoon a little. We left the main anchorage and charted zone and headed off in search of our own little spots in paradise. The water was so clear we could see the bottom in 20m which made spotting coral heads easy, we stopped in four different spots in the lagoon and all were just perfect and we were on our own with just fish for company. Unfortunately though we left our motor on the dinghy one night in our relaxed state and the valve failed sending the engine for a little swim - so we headed to Tiputa again in search of fresh fuel and spark plugs but found a village bbq on the sea front. We joined a group of locals drinking and relaxing on the gorgeous Sunday afternoon and had a fab meal of duck and some kind of meat, we met Tahuata as we had anchored in front of his house, next thing we had half the village around us trying to communicate with us in our very poor French. While we sat in the sun three dolphins gently swam by making little arches right in front of the gathering - wow! Tauta took Andrew off on his scooter to show him where his house was so we could visit him the next morning, it turned out he was a mechanic so gave us some spark plugs (unfortunately they didn't fit, but how kind??). We went to visit Tauta and his family the next morning and he showed us around his home and talked with us about the atoll - such a lovely man we felt really honoured to have met him and be invited to his home. The houses have several buildings some communal and others just beds, generations of one family live in the same place. We arrived safely in Rangiroa in the Tuamoto Archipelago on Sunday. We had to bypass Ahe as we had made such good time we would have had a long overnight wait outside the pass until it was safe to go in so we continued on to the next Atoll. Some local fishermen helped us out and pointed the way in as it was difficult to see with huge waves breaking all around us. The pass was running at about 5 knots out to sea and as a result there were overfalls and whirlpools which we ploughed right through. Without doubt the most exciting arrival we have ever undertaken but slowly we were able to battle through the entrance into the calm of the lagoon- (much overheated engine and frayed nerves). The place is truly paradise. A huge lake in the middle of the ocean surrounded by 140 islands. Its 40 miles across, flat calm and the bluest blue. Tomorrow we are making a drift dive through the pass, you jump in at one end and the rescue boat collects you as you zip out the other side. Its full of sharks and other wildlife- we'll write a full report later.